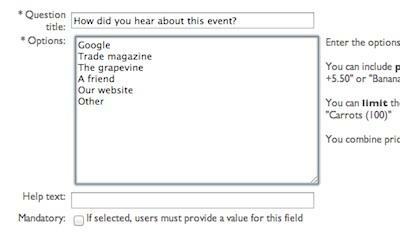 Your event entry form is the is many of your entrants' first experience of your organisation, it should be fast-loading, clearly laid out and easy to understand. It's also an obvious place to handle terms and conditions agreements, merchandise purchases and other optional extras. Finally, it shouldn't be dauntingly long or complicated to fill in, and if users make a mistake they should be able to fix it and continue easily. On the left is a preview of how your form will look, on the right the are buttons for adding different kinds of controls (rich text, simple questions, multiple choice questions etc.). You can add as many questions as you like, and even do advanced things like limit how many people can choose each option, or add price-adjustments to the entry fee based on which options entrants select. 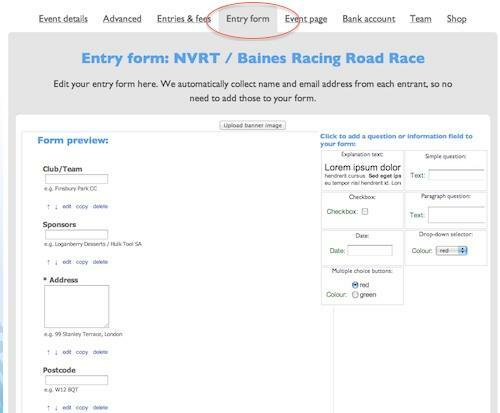 Finally, you can use our form builder to require that users accept your terms and conditions (whatever they may be) before submitting their entry form, and also to collect charitable donations with gift aid information.